For the ward of Runnymede associated with the town and with Staines upon Thames, see Egham Hythe. 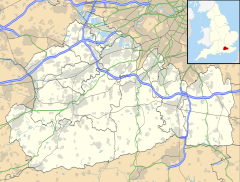 Egham (/ˈɛɡəm/ EG-əm) is a town in the Runnymede borough of Surrey, in the south-east of England. It is part of the London commuter belt and has its own railway station. It adjoins, narrowly, junction 13 of the M25 motorway and is situated 19 miles (31 km) WSW of London. It can be considered a university town as it has on its higher part, Egham Hill, the campus of Royal Holloway, University of London. Not far from this town, at Runnymede, Magna Carta was sealed. The manor of Egham, which includes Runnymede belonged formerly, and in 1215, to Chertsey Abbey, and after the dissolution (around 1540) became the property of the Crown, though granted to various tenants (holders) at different times. Magna Carta was sealed at nearby Runnymede in 1215, and is commemorated by a memorial, built in 1957 by the American Bar Association, at the foot of Cooper's Hill (a small rise adjacent to the Thames floodplain, immortalised in verse by such luminaries as John Denham ('Cooper's Hill') and Alexander Pope ('Windsor Forest')). A Sculpture by artist David Parfitt portraying King John and Baron Fitzwalter in the act of sealing Magna Carta is also in Church Road in the centre of town. Another memorial at the top of the hill in nearby Englefield Green, the Air Forces Memorial commemorates Commonwealth air force personnel killed in World War II but who have no known grave. It was the first new-built British building to be listed in the post-war era. The memorial is administered by the Commonwealth War Graves Commission and freely open to the public year-round. It has excellent views towards London, Windsor and the Surrey Hills, as well as being a place of quiet contemplation and reflection. Egham at one time held horse races which took place at the Runnymede meadow, which interfered with the Inclosure Act of 1814 (54 G. III, c. 153) and the consequent award made in 1817, which divided up the meadow, as the Act stipulated that any enclosures which should interfere with the holding of Egham races at the end of August upon its usual course must be removed every year. In 1836 the races were presided over by William IV, who gave a plate to be run for at the meeting, which coincided with festivities at Windsor for his daughter's marriage. The races ceased in 1884. Other than two forming the hub of today's Virginia Water (including Wentworth), the principal properties were 'Egham Manor and Park', 'Egham Wick', 'Kenwolde Court', 'Markwood', 'Kingswood' and 'Alderhurst' for a time home of Lord Thring. During World War II, American author Theodor Seuss Geisel, better known as Dr. Seuss, was briefly stationed in Egham as part of his work on the propaganda film Your Job in Germany. He did not settle well in the town, despite the efforts of his RAF host Flight Sergeant Sam Beckinsale to draw the local amenities to his attention. When it was pointed out how green the area was, due in part to its proximity to Windsor Great Park he retorted "I do not like green Egham". Geisel later cited this as the inspiration for his 1960 best-selling book Green Eggs and Ham and the often-repeated line in the book "I do not like them Sam I Am. I do not like green eggs and ham". Parts of Egham have featured in national and international news in the 21st century. On 12 September 2007 a case of foot-and-mouth disease was found in Egham, 12 miles (19 km) from the previous outbreak found in early August 2007. In December, 2008, Egham was at the centre of a controversy due to possible traffic impact on the three level crossings in the town to be kept in situ under the abandoned Heathrow Airtrack project. Occasional flooding of Runnymede and parts of Egham Hythe have taken place following exceptional Thames Valley winter rainfall. Units of the army were deployed to assist with defences and dealing with damage from flooding in the 2013-14 winter storms. Egham once lay within the Godley hundred, which lay in the early medieval period within Windsor Forest in a part of it which was subject to a long-running dispute as to whether it lay within the historic county boundaries of Surrey or Berkshire. Egham Rural District was a Local Government District within the administrative county of Surrey. It was created in 1894 and replaced in 1906 with Egham Urban District, which was later abolished in 1974. Since 1974, Egham has been part of the Runnymede borough of Surrey. Nearby are Staines-upon-Thames, Bagshot, Sunningdale, Englefield Green and Virginia Water, Windsor Great Park, Old Windsor and Windsor itself. The area between Egham and Staines town centres is known as Egham Hythe. North of Egham is Wraysbury, home of the British Disabled Waterski Association. South is Thorpe Park, a large theme park of rides and attractions. Also near Egham is Ascot Racecourse - another big attraction. Egham is home to a large research centre for Procter & Gamble, the London Innovation Centre, on Rusham Park, formally owned by Shell oils. P&G has over 550 employees in Egham, working on Fine Fragrance, Beauty Care and Health Care brands, such as Hugo Boss, Olay, and Vicks although in May 2012 P&G announced plans to shed 125 of these jobs. Other notable employers include HCL AXON (an information technology consultancy), Belron (parent company of Autoglass), the EMEA Headquarters of Future Electronics, and the European headquarters of Enterprise Holdings; parent company of the Enterprise Rent-a-Car, Alamo, and National vehicle rental companies. Egham is also home to CAB International Europe UK, which holds one of the world's largest collections of microorganisms and the HQ of Spectris PLC, a supplier of precision instrumentation and controls with 8900 employees worldwide. Egham and the eastern part of its historic parish, Egham Hythe, share connections with the development and enhancement of prestige sports cars. Egham has been Ferrari's spiritual home in the United Kingdom in the listed Tower Garage. Lagonda was based here. Egham today contains a Ferrari, Maserati, and a Porsche dealership. Egham has many pubs including The Foresters, The Happy Man, The Crown, The Packhorse and The Red Lion. The Spring Rise area of Egham is home to the United Services Club which was formed in 1921 and has recently become well known nationally for the three Real Ale festivals it holds every year. Egham has a Non-League football club, Egham Town F.C., who were promoted as Champions from the Combined Counties football league in the 2012-13 season and are now established in the Southern League Central division. Egham Town F.C. play in the 5,500 seat Runnymede Stadium, Wards Place just beyond the Pooley Green playing field on Thorpe Lea Road. A rowing club, Staines Boat Club, is on the Egham side of Staines Bridge in the associated neighbourhood (postally), Egham Hythe. The Egham Royal Show takes place every August. 23–24 August 2014 was the 156th show. Watercolour of eastern entrance to Egham, pre. 1817. Egham has a small museum based in the Literary Institute hailing the Dalradian metasediments. Strode's College is an institution in Egham dating back to 1706 and was a grammar school before being designated a sixth form college in 1975. Royal Holloway, University of London is south of Egham along the A30 road at Englefield Green. It provided accommodation for London 2012 competitors who competed at Eton Dorney. The Magna Carta School, formerly Hythe County Secondary and Egham Hythe Secondary Modern, is a comprehensive school in Egham Hythe. ACS International Schools has a campus in Egham. St John's Church Egham is on Church Road, the continuation of the High Street, and is an evangelical Anglican church in the Diocese of Guildford. There are approximately 320 members and a usual Sunday attendance is around 300. The incumbent Vicar is the Revd Esther Prior. The Church of Our Lady of the Assumption is a Catholic church at Englefield Green. It is situated on Harvest Road in the village, just off the A30 road. It was built from 1930 to 1931 and designed by Joseph Goldie. It serves the Parish of St. Cuthbert which includes the Catholic Chaplaincy to the nearby Royal Holloway of the University of London. On Sundays, it is usually standing room only, filled with local parishioners and students from Royal Holloway. The United Church of Egham is a local union of the Methodist Church and the United Reformed church. It occupies a Victorian building in the centre of Egham High Street. Hythe Community Church, Meets at The Hythe Centre, Thorpe Road, Egham Hythe, Surrey TW20 8BN every Sunday at 11 am . Runnymede Christian Fellowship is an international group of people that meet to worship and have fellowship together. They are Pentecostal in nature and part of the Assemblies of God (UK). They meet at Virginia Lodge, Station Road, Egham. Insanity Radio 103.2FM is a local radio station with studios in Egham. It is owned jointly by Royal Holloway, University of London and its associated Students' Union, and run by students of the University as well as local volunteers. It provides entertainment, topical, and educational content aimed primarily at young people in the area, and works to develop relations between student and non-student residents of the town. The proportion of households in the civil parish who owned their home outright compares to the regional average of 5.1%. The proportion who owned their home with a loan compares to the regional average of 326.5%. The remaining % is made up of rented dwellings (plus a negligible % of households living rent-free). William Chaloner, counterfeiter, ran a coining operation in Egham. Frank Muir, comedy writer and broadcast personality lived in Egham towards the end of his life. ^ Kelly, S. E., ed. (2015). Charters of Chertsey Abbey. Anglo-Saxon charters. 19. Oxford: British Academy. p. 89. ISBN 9780197265567. ^ Gover, J. E. B.; Mawer, A.; Stenton, F. M. (1934). The Place-Names of Surrey. English Place-Name Society. Cambridge: Cambridge University Press. p. 120. ^ Judith Morgan (1 August 1996). Dr. Seuss and Mr. Geisel: A Biography. Da Capo Press. pp. 207–211. ISBN 978-0306807367. ^ H.E. Malden, ed. (1911). "Parishes: Egham". A History of the County of Surrey: Volume 3. Institute of Historical Research. Retrieved 10 December 2013. ^ "Egham Museum". Egham Museum. ^ "London 2012 Venues". Archived from the original on 13 October 2008. ^ "Insanity Radio Key Commitments" (PDF). ^ "St Paul's Church, Egham Hythe". ^ "City & County Information, Town & Community Information - ePodunk". Archived from the original on 27 March 2012.